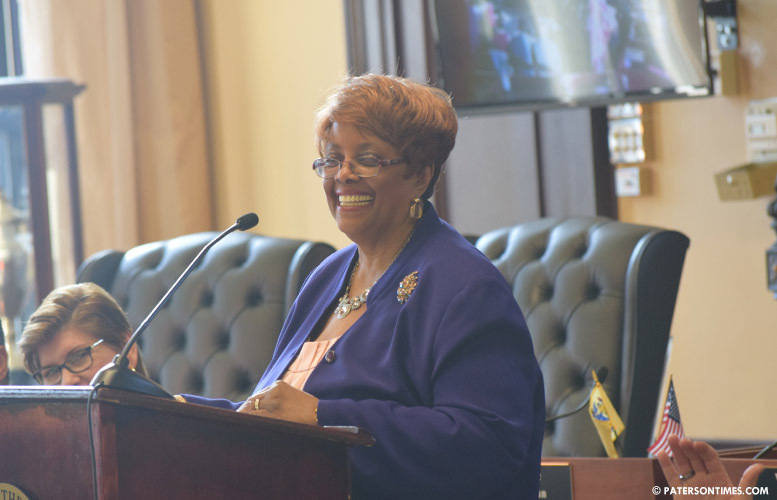 Mayor Jane Williams-Warren weighed in on the controversy that erupted two days ago around the impending opening of a police substation at the South Paterson library on Wednesday evening. Williams-Warren explained the rationale for opening a substation at the South Paterson library. Her administration began looking for office space to accommodate the growing Community Policing Unit. “We were looking for office space. That was our only intent,” said the mayor. Her administration looked at the White House in Eastside Park to locate the substation, but recreation coordinator Benjie Wimberly opposed it. Wimberly’s division uses the White House for its summer program, he told the mayor. She then spoke to library director Corey Fleming to see if there was office space at any of the libraries. Fleming mentioned the South Paterson library. A tour was conducted by administration officials that led to the selection of the library on Main Street as the future home of the Community Policing Unit. Councilman William McKoy had asked on Tuesday night why there was a need to open a substation in the South Paterson section which is safe compared to neighborhoods in the 1st, 4th, and 5th Wards. McKoy said there was no study or analysis done that pointed to a need for a substation on Main Street. McKoy was upset at councilman Andre Sayegh claiming credit for the substation. He was joined by councilman Michael Jackson in demanding an immediate explanation from police chief Troy Oswald. Both McKoy and Jackson wanted the police chief to appear before the council just two hours after Sayegh’s press conference announcing a substation would be housed at the library by mid-June. Business administrator Nellie Pou told the council the chief wasn’t in the area. She provided an explanation of how the substation came about. She said the substation was something that originated with the administration. Sayegh, McKoy, and Jackson are among six men running for mayor. The others are Alex Mendez, Alex Cruz, and Pedro Rodriguez. Sayegh’s opponents see the substation press conference as the 6th Ward councilman’s way of securing an edge in the race by styling himself as a hands-on public safety mayor. Crime is the biggest issue in the race, according to a majority of the candidates. Kenneth Morris, councilman at-large, wondered how Sayegh knew about the date the substation would open. Other council members were not told of the substation and its opening date, he said. The mayor said Sayegh was informed of the substation because it is in his ward. “That’s how he knew about it,” said Williams-Warren. Williams-Warren said the selection of the South Paterson library was purely based on need for office space. She said the space needs to be painted and doors have to be changed. There’s also other renovation work that has to be done. The substation will open in mid-June, she said. The mayor, who took office following the conviction of Jose “Joey” Torres late last year, has shied away from political controversies that grip the city every few weeks. She has no plans to endorse any of the six candidates in the mayoral race. “I’m here to help my community. I’m not here to get involved in all this controversy,” said Williams-Warren. Although Sayegh is on the receiving end of criticism for taking credit for the substation, he praised Williams-Warren. “She has restored integrity to City Hall,” he said. Really out of all the high crime areas you want to put it on south paterson? Crimes such as Homicides, robberies, domestic violence, prostitution, juvenile delinquency are not at big issue at south paterson. Mr sayegh needs to rent an apartment on 10th avenue or Godwin ave and speak to surviving victims of violence more often. May god bless paterson and guide its inhabitants to righteousness through mercy.